BPMN, or the ‘Business Process Model and Notation’, is a method for mapping out the approach to a business process; that is, creating a visual representation of a complex business practice or process flow. This is designed to give major stakeholders the clarity and perspective required to make informed decisions, just as a well-drawn map can help you to figure out the best possible route to your destination. The essence of BPMN involves establishing the location of individual processes and departments, along with their relationships to each other. This style of diagramming is generally easier to understand than narrative text, allowing users to explain relationships that may otherwise require experts to interpret. The right BPMN tool could even do wonders for your organization’s planning efficiency. BPMN diagrams can provide these actors with the terminology to communicate their ideas and make decisions with a much greater sense of perspective. This in turn can ease collaboration and even boost morale, since everyone will be able to see the purpose and benefits of their own contributions. In essence, business process modeling techniques are a lot like flowcharts, just slightly more complex. They utilize graphical notation to outline process steps, the placement of departments and so on in order to create blueprints for businesses. Observers can then pinpoint specific areas in order to understand how they relate to each other, as well as how they can be improved. A BPMN model is made up of ‘pools’ and ‘swimlanes’. There will be multiple swimlanes within a single pool, with each representing different participants and responsibilities. Tasks and information can also flow between swimlanes, affecting them simultaneously. It goes without saying that different factors within a business are never entirely independent; by understanding the connections between them, you can get a clearer perspective of how the business works and how prospective changes may impact it. You can also understand how information and activities flow towards the endpoint of a process, such as a finished product or service. A key part of this process is the terminology of BPMN. This can be applied to models of varying complexity, from simple hand-drawn diagrams to huge complex blueprints. Each will utilize the same shapes and terminology in order to make the finished blueprint accessible to all. How can a BPMN Certification Help my Organization? BPMN offers a number of potential advantages to businesses of all sizes. The essence of its offering is clarity, helping users to determine objectives and processes in a way that will allow them to control their organizations with a greater sense of perspective. Once a business is familiar with the terminology of BPMN, it can also enjoy clearer communication between different stakeholders and departments. A crucial aspect of this is BPMN’s ability to link technical and non-technical audiences with a single, clear language. Sub-models can also be created to allow actors to view sections and pieces of information which are relevant to them, without having to make a business’s entire model transparent to all employees. Why Study BPMN with Good e-Learning? 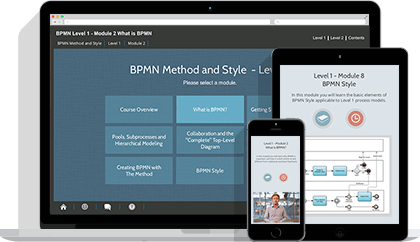 The Good e-Learning BPMN 2.0 Foundation & Practitioner course was written by BPMN experts to get both newcomers and experts up to speed with the latest version of BPMN as quickly as possible.